This workshop will consist of two sessions with their own objectives. Boogie your way into this workshop designed to explore using movement and dance as tools for building relationships with play therapy clients. Attendees will also learn how to teach clients to express themselves more fully and creatively. Attendees will be able to use dance and movement techniques to help clients learn to explore feelings, attitudes, and patterns of behavior. Furthermore, clients will learn to access their body’s wisdom, practice new ways of interacting with others, build trust, share control, increase cooperation in problem situations, and enhance their relationships with others. Attendees will go home with new activities they can use in their play therapy practice with children, adolescents, and with adults; with groups, families, and individual clients. Use two different movement and/or dance strategies to help assess play clients, their issues, and their coping strategies. Describe two different movement and/or dance strategies that can be used to help play therapy clients practice more adaptive and pro-social ways of solving problems and interacting with others. Use two different movement and/or dance strategies for helping play therapy clients, especially tactile/kinesthetic learners, become more able to express themselves. The focus of this fun and entertaining experiential workshop is on using drawings and art techniques to gain a better understanding of client’s perceptions of themselves at home, school, and work and to examine their relationships with family members, teachers, and peers. Attendees will explore drawing strategies that can be used as interventions, including several different styles of feeling drawings, body outlines, problem pass- around, and time lines. Other art techniques, such as Invent-a-Pet, Gremlin puppets, Mouthpiece puppets, and mandalas will round out this blast of a workshop. Attendees don’t have to have artistic talent to attend…all you have to bring is a willingness to try new things, a desire to laugh and have fun, and the ability to wear comfortable play clothes! Use two art techniques for building a relationship with the client in the process of play therapy. Use two art techniques for helping clients gain insight during the process of play therapy. Use two art techniques as intervention tools to help clients learn and practice more adaptive patterns of thinking, feeling, and behaving as part of the process of play therapy. Terry Kottman, Ph.D., Registered Play Therapist-Supervisor, NCC, LMHC, founded The Encouragement Zone, a center where she provides play therapy training, life coaching, “playshops” for women, and play therapy supervision. She regularly presents entertaining and engaging experiential workshops on play therapy; adventure therapy; activity-based counseling; counseling for children, adolescents, and their parents; consultation with teachers; and coaching adults. Prior to founding The Encouragement Zone, Terry spent eight years as a professor of counselor education at the University of Northern Iowa in Cedar Falls, Iowa, and five years as a professor of counselor education and director of the Child and Family Resource Clinic at the University of North Texas in Denton, Texas. In 2014, Terry was honored to receive the Lifetime Achievement Award from the Association of Play Therapy. In 2017, she received a Lifetime Achievement Award from the Iowa Association for Play Therapy. Lunch: LUNCH WILL BE PROVIDED from 12:00-12:45 PM. Please let us know in advance if you have dietary restrictions. Business Meeting: Everyone is welcome to attend our bi-annual business meeting from 12:45- 1:00. Conference Center- 810 St. Vincent’s Dr., Birmingham, AL 25205. Workshop participants can park in the North Tower Parking Deck. Parking coupons sold at registration on the day of for $6.50. Parking can also be paid at the exit gate for $7.50. If possible, please bring cash to purchase parking vouchers. Six Contact Hours will be awarded for a full day of attendance. No partial credit will be awarded. Marriage and Family Therapists: The Alabama Board of Examiners in Marriage and Family Therapy (ABEMFT) approves courses that are NBCC approved for CE credit. REGISTER EARLY – SEATING IS LIMITED to provide room to DANCE! Spaces are not guaranteed until your registration is processed. **ONLINE REGISTRATION DEADLINE IS Friday, June 14th, 2019. A discount of $10.00 per registrant for groups of 3 or more registering together. Please specify if registering as a group and identify group members and affiliation. Check or money order only if registering by mail. Credit Cards accepted if registering online. No Purchase orders accepted. Registrants canceling up to 48 hours before a workshop will receive a tuition refund less a $20 administrative fee, or if requested, a voucher good for one year for a future workshop. All requests must be made in writing or by email. No refunds issued for any reason after June 19, 2019. In the unlikely event the workshop cannot be held, registrants will receive complimentary admission to a rescheduled workshop or a full value voucher, good for one year, for a future workshop. Stay up to date on all that is happening with AAPT. To register on-line, go to the conference area of the website at www.alabamaplaytherapy.org and sign up to receive emails from AAPT so you can stay up-to-date with news and announcements from AAPT!!! Counselor education curriculums address the importance of ethics and legal issues, but do not specifically attend to ethics in counselor testimony. The lack of education on legal proceedings leaves counselors unprepared to serve as a competent witness and incapable of representing the counseling profession adequately. Being poorly informed about aspects of the judicial system places counselors at risk for ethical violations, including violating confidentiality and not protecting the welfare of clients. During this workshop, the essential areas of knowledge and skills are described that play therapists specifically should know prior to being called to provide testimony in courts. Information on ethical documentation and other ethical concerns will be provided, court documents will be explained (including subpoenas and motions to quash), tips for providing testimony will be thoroughly discussed, and mock court testimony will be presented. 1: Play therapists will learn ways to ethically document when involved in court proceedings. Play therapists will be provided with information on how to file Motions to Quash to protect documentation. 2: Play therapists will become knowledgeable about the various court documents. Play therapists will be provided examples of subpoenas and given information on how to proceed with subpoenas. 3: Play therapists will learn specific suggestions for testifying in court. 4: Play therapists will become knowledgeable of the different court systems. 5: Play therapists will view examples of different testimony experiences (fact vs expert witness, cross examination, depositions). Morgan Jenkins is an LPC, has a PhD in Counselor Education and Supervision, and currently owns a private practice in Auburn, AL. She worked at a children’s advocacy center as a forensic interviewer and therapist, where she had years of experience testifying in court on behalf of her clients. Margaret Taylor is Visiting Assistant Faculty at Auburn University and owner of The Well Counseling Center. Prior to opening a private practice Margaret worked as the Executive Director and forensic interviewer for the Tri-County Children’s Advocacy Center for 10 years. During this time Margaret testified in over 100 court hearings in various courts including District, Circuit, Juvenile courts, grand jury, custody hearings and Federal court. Margaret enjoys educating and training counselors to become competent and confident expert witnesses and has done so at State, Regional and National Conferences. Clayton Kim Taylor is currently the District Judge for Tallapoosa County Alabama and has served in this position for 20 years. Judge Taylor presides over District, Criminal and Juvenile courts, while also being responsible for DHR custody hearings and termination of parental rights hearings. Prior to becoming a Judge, he served as a private attorney for various criminal cases. Judge Taylor enjoys preparing professionals to provide professional testimony in court and has presented at State, Regional and National conferences. Counselors: Alabama Association for Play Therapy (AAPT) has been approved by NBCC as an Approved Continuing Education Provider, ACEP No. 6211. Programs that do not qualify for NBCC credit are identified. Alabama Association for Play Therapy is solely responsible for all aspects of the programs. ** ONLINE REGISTRATION DEADLINE IS Friday March 29, 2019. Mail in registration must be postmarked by March 29, 2019. Registrants canceling up to 48 hours before a workshop will receive a tuition refund less a $20 administrative fee, or if requested, a voucher good for one year for a future workshop. All requests must be made in writing or by email. No refunds issued for any reason after April 3rd, 2019. In the unlikely event, the workshop cannot be held; registrants will receive complimentary admission to a rescheduled workshop or a full value voucher, good for one year, for a future workshop. To register online, go to the workshop area of the website and sign up to receive emails from AAPT so you can stay up-to-date with all news and announcements from AAPT! The Alabama Association for Play Therapy is Coming to Your Area to Celebrate! APT Members and non-members plan to join us for free appetizers! Email AAPT President, Kori Babel at KHBabelPhD@gmail.com if you have questions. The principles of the Integrative Attachment-Informed Model will be discussed in this workshop. This play therapy model integrates attachment theory, Theraplay*, and playful Trauma-Focused Cognitive Behavioral Therapy. The Integrative Attachment Informed Model is a tiered, prescriptive play therapy treatment dependent upon attachment style and relationship security of the child. As the parent-child dyad develops healthier attachment interactions, the child’s therapy progresses up the I AIM tiers from III to I. Tier III addresses the needs of children with severe attachment issues including Reactive Attachment Disorder or disorganized attachment. Tier III includes attachment-specific play therapy interventions, including Theraplay. Tier II is for children with insecure (anxious or avoidant) attachments. Tier II is an integration of attachment work using Theraplay and other attachment-based play therapy concepts and interventions as well as introducing basic coping skills such as breathing techniques. Tier I is similar to Cognitive Behavioral Play Therapy without a focus on attachment, as children with relatively healthy attachment styles can benefit from more standard cognitive behavioral play therapy interventions. I AIM includes the following components: Assessment, Parenting, Regulation/Relaxation/Relationship, Executive Functioning, Affective Awareness and Modulation, Cognitive Understanding and Strategies, Narratives and Termination. *Theraplay is a dyadic therapy based on Bowlby’s attachment theory and neurobiological research which informs its relationship-based approach. Since Theraplay is modeled on the pattern of healthy parenting that leads to secure attachment, four dimensions of parent-child interaction are considered: Structure, Engagement, Nurture and Challenge. Theraplay’s Marschak Interaction Method (MIM) is used to assess the strengths and challenges in the parent-child relationship and to focus the intervention to improve the relationship. Healing the relationship is the primary focus of this part of the treatment. Objective 1-Describe the theoretical foundations of the Integrative Attachment-Informed Model (I AIM), a play therapy model that integrates Theraplay and Cognitive Behavioral Play Therapy. Objective 2-Describe the principles of I AIM and describe how the three tiers of play therapy treatment depend upon attachment style. Objective 3-Describe the four Theraplay dimensions and how they are used to respond to the particular needs of the parent-child relationship. Objective 4 -Demonstrate at least one play therapy intervention of Theraplay and at least one play therapy intervention I AIM. Objective 5- Discuss integrating neuroscience research with the play therapy model, I AIM. Dr. Cavett is a child and adolescent psychologist who provides assessment, diagnosis, and treatment of children, adolescents, and families. Dr. Cavett earned her Masters from St. Mary’s University of Minnesota (1999) and Doctorate from the University of North Dakota (2002) and completed a child clinical psychology internship at Astor Home for Children in Rhinebeck, New York. She has 19 years post-masters and16 years post-doctoral experience. As a licensed psychologist, Dr. Cavett provides therapy related to mood disorders such as depression, anxiety, abuse/trauma issues, attachment, behavioral problems, and pervasive developmental disorders. She is a Registered Play Therapist-Supervisor credentialed through the Association for Play Therapy. Dr. Cavett provides supervision for licensed clinicians working towards the Registered Play Therapist or Registered Play Therapist-Supervisor credential. She has been an invited presenter internationally on child psychopathology, development and treatment. She is the author of numerous chapters and the book Structured Play-Based Interventions for Engaging Children and Adolescents in Therapy (2010). She has served on several committees for the Association for Play Therapy and the North Dakota Psychological Association Board of Directors. She is the 2018 Service Award Recipient for the Association for Play Therapy, a national organization that provides training and credentialing for play therapists. LUNCH WILL BE PROVIDED from 12:00-12:45 PM. Everyone is welcome to attend our bi-annual business meeting from 12:45- 1:00. REGISTER EARLY – SEATING IS LIMITED! Spaces are not guaranteed until your registration is processed. Registrants canceling up to 48 hours before a workshop will receive a tuition refund less a $20 administrative fee, or if requested, a voucher good for one year for a future workshop. All requests must be made in writing or by email. No refunds issued for any reason after January 30, 2019. In the unlikely event the workshop cannot be held, registrants will receive complimentary admission to a rescheduled workshop or a full value voucher, good for one year, for a future workshop. Save the Date! Integrative Attachment Informed Play Therapy on February 1st, 2019! Register by September 5, 2018 to save! Special hotel rate for APT Conference attendees is $189 per night (plus tax) for single/double occupancy and includes complimentary Wi-Fi in guestroom. Reserve online or call 866-837-4213. Room availability and special rates are available until September 5, 2018, or until the space is filled. We urge you to make your hotel reservations early. This program will explore will explore what Play Therapy is with an overview of the history and current research. Evidenced and practiced based techniques, focusing on children, will be provided through experiential activities. Have a brief overview of key professionals in the field of Play Therapy (current and past). Be educated on APT and AAPT and how becoming a Registered Play Therapist can enhance client care and outcomes. Gain a deeper understanding of why play is important in the therapeutic process and the power of play in healing. Learn at least three hands-on Play Therapy techniques to use in family therapy to increase communication and reduce maladaptive behaviors. Engage in bibliotherapy and practice experiential techniques with Brave Play Atoms to explore treatment goals in therapy. Ashley L. Garrett is a Licensed Professional Counselor (#2918) and a Board-Certified Counselor with a strong background in working with clients who have a limited support system and have experienced trauma. She is a Registered Play Therapist and Supervisor. She earned her education specialist in Community Agency Counseling and a master’s degree in Agency Counseling from Jacksonville State University. She has a bachelor’s degree in Human Development and Family Studies from Samford University. Ashley has special interest and experience in providing supervision and consultation to mental health providers, parenting support through online groups, and consultation with city and state agencies. Ashley has experience leading seminars and groups for churches, universities, business, public schools and other interested groups. Ashley is a member of the American Counseling Association, the National Board of Certified Counselors (NBCC), the Alabama Counseling Association (ALCA), Association for Child and Adolescent Counseling, and the Association for Play Therapy. Ashley is also the owner and director of Garrett Counseling located in Jacksonville and Boaz, Alabama. Registrants canceling up to 48 hours before a workshop will receive a tuition refund less a $20 administrative fee, or if requested, a voucher good for one year for a future workshop. All requests must be made in writing or by email. No refunds issued for any reason after July 11th, 2018. In the unlikely event, the workshop cannot be held, registrants will receive complimentary admission to a rescheduled workshop or a full value voucher, good for one year, for a future workshop. Online Registration has closed but there are still spots available. Come join us and register onsite this Friday! A Family that Plays Together Stays Together! Working with families can be challenging enough so why not make it fun? This workshop will show you how to engage families in therapeutic activities to help the members take responsibility, discover patterns of interaction, and make positive changes. Participants will discover the power of Family Play Therapy and learn several practical techniques that they can implement immediately! Scott Riviere, MS, LPC, RPT-S, is a Licensed Professional Counselor and one of the first Registered Play Therapist-Supervisors in Louisiana. He is the Director of K.I.D.Z., Inc., Louisiana’s first Play Therapy Institute, where his practice is limited exclusively to children and adolescents and their families. During his 25+ years of practice, he has worked in various clinical settings and has extensive training in the field of Play Therapy. He has served on various committees for the Association for Play Therapy and is currently serving on the Board of Directors. He has created several therapeutic products for mental health professionals and is a published author and frequent guest on various media outlets. Mr. Riviere has also produced a series of parent training videos titled “Positive Parenting”. Workshop participants can park in the North Tower Parking Deck. Parking coupons will be sold at the registration table on the day of for $6.50 or the fee will be $7.50 at the parking attendant upon departure. **ONLINE REGISTRATION DEADLINE IS SATURDAY, June 8th, 2018. Registrants canceling up to 48 hours before a workshop will receive a tuition refund less a $20 administrative fee, or if requested, a voucher good for one year for a future workshop. All requests must be made in writing or by email. No refunds issued for any reason after June 14, 2018. In the unlikely event, the workshop cannot be held, registrants will receive complimentary admission to a rescheduled workshop or a full value voucher, good for one year, for a future workshop. 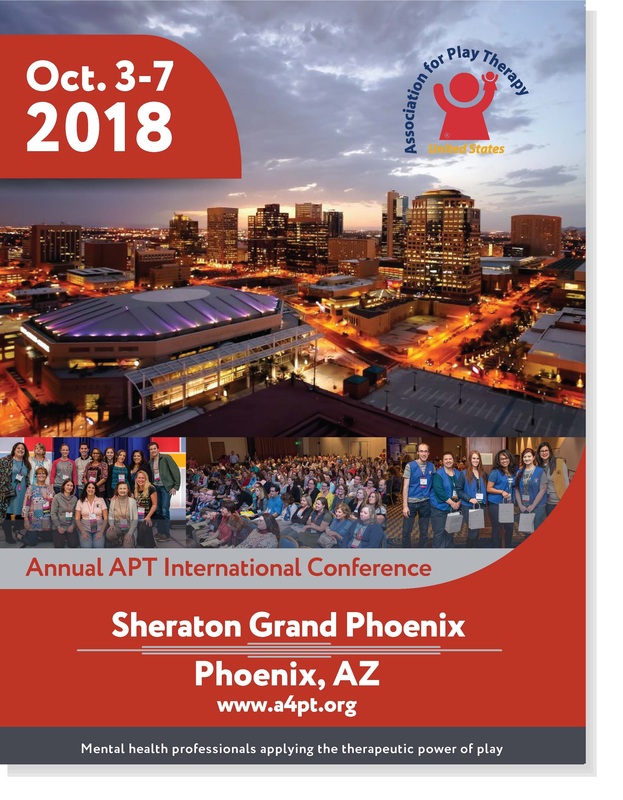 Stay up-to-date on all that is happening with AAPT! The Bi-Laws and Ethics Committee of the Alabama Association for Play Therapy is please to coordinate the 1st Annual Graduate Student Poster Presentation. The poster presentation is an excellent opportunity to recognize the work of students exploring the use of play therapy in their practicum and internship semesters. The presentation will feature research, literature reviews, and/or projects that pertain to the field of play therapy. The information will need to be presented on a tri-fold poster that can be presented on a table. Easels will not be available. The student will not make a formal presentation, but will stand with the poster and interact with workshop attendees during workshop breaks. Students are allowed to bring handouts that summarize their posters and include references to the materials presented. All proposals are to be submitted via e-mail no later than the close of business on Friday, March 30th. Accepted poster presentations will be notified by Friday April 6th. All students who participate must either be a full member of the Association for Play Therapy or be an E-Student member. Presenters will be able to attend the workshop for free, but will not earn CE credit. Hours may be used to fulfill non-direct internship hours. Send completed presentation forms to Hallie Keel at halliekeel@gmail.com.